Why not make your equine search a bit of a holiday? At the riding centre perspective buyers will be shown a selection of horses to meet their needs: top bloodline competition prospect, fox hunter, pony jumper, or all around super horse. You will be given plenty of opportunity for hacking out, stadium jumping, and cross country riding and jumping. Additionally, depending on the season you may participate in a competition and/or fox hunt. Whether you are looking for a competition prospect, fox hunter or a super pleasure horse our contacts in Ireland have built a solid reputation on matching suitability of horse and buyer. Aille Cross and Fairfield offer an excellent selection of prospects suitable for any discipline. William Leahy, Jr's Fairfield Farm specializes in horses with top RID and ISH bloodlines such as Clover Hill, Cruising, Cavalier, etc. 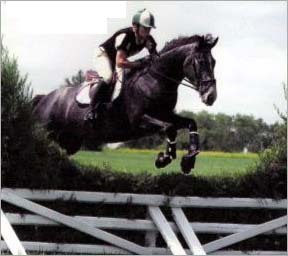 Many have gone on to achieve great success in Show Jumping (including Grand Prix), Eventing, show hunters, and of course fox-hunting. Videos of sale horses can be made available upon request. Ever since the birth of show jumping in Ireland the Irish Draught has played a major role, and are gaining worldwide popularity for their athleticism, even temperament, and durability. Versatile by nature, the Irish Draught can be found competing in show-jumping, eventing, dressage, driving, and show-hunters. At many of the world's largest competitions you will find many of the top finishers to be of Irish bloodlines. 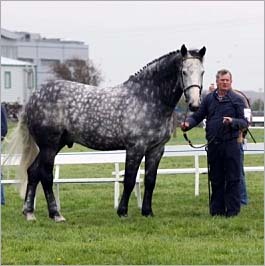 For more information about these wonderful Irish bred horses please visit the Irish Draught Society of North America at www.irishdraught.com or the Irish Draught Society, Ireland at www.irishdraught.ie . Fall 2007: Congratulations Toni on the purchase of "WELCOME"! Update on Toni and "Welcome": Welcome arrived in October 2007. After settling in for a couple of weeks, it was time to get to business. They have become quite a popular pair in the hunt field and are currently preparing for their second hunt season. Recently the pair were spotted in a local parade. When not hunting, they will be competing in dressage and perhaps try some eventing this spring! *Forest Luck Equestrian acts solely as a referral agent, therefore will not guarantee the suitability and/or soundness of any animal. We strongly encourage and advise pre-purchase veterinary examinations and x-rays if desired. This site and its contents are copyright © 2019 Forest Luck Equestrian.